Remote Zavodovski Island, located in the Southern Atlantic Ocean, is the northernmost of the South Sandwich Islands, 570 km SE of South Georgia Island. 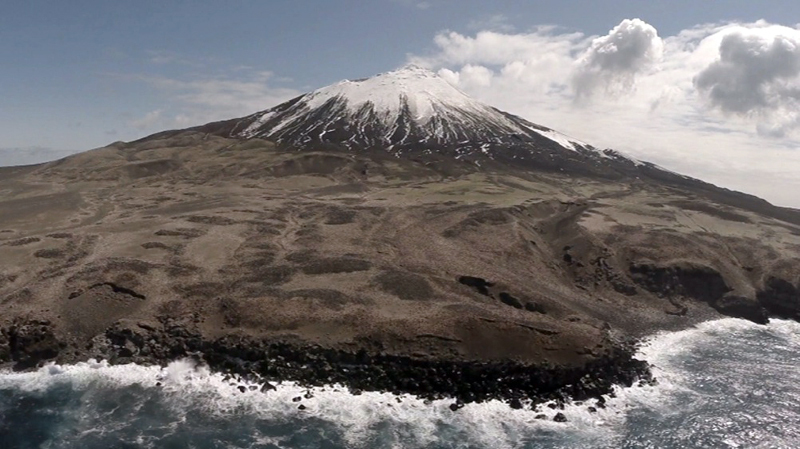 The basaltic stratovolcano on the island, known as Mount Curry, has a large lava platform extending east from two parasitic cones on the side of the main edifice. Steam emissions from the summit have been observed by researchers, fishing vessels, and tourists who visit the island to see the population of over one million chinstrap penguins. The only confirmed historical eruption was that observed in 1819 by the Russian explorer Bellingshausen. In early July 2016, a photograph of ash and steam emitting from the volcano was released by the British Antarctic Survey (BAS). While steam plumes have been observed emitting from Mt. Curry on a number of occasions, observations of volcanic ash had not been documented in modern times until June 2016. The MODIS instrument (Moderate Resolution Imaging Spectroradiometer) on NASA's Aqua satellite captured a unique image of the interaction of low-level emissions from Zavodovski and the atmosphere on 27 April 2012 (figure 1). Aerosol particles from the volcano are key to the formation of clouds, but whether they are derived from steam plumes, magmatic gases, or volcanic ash is unclear from this image. Figure 1. 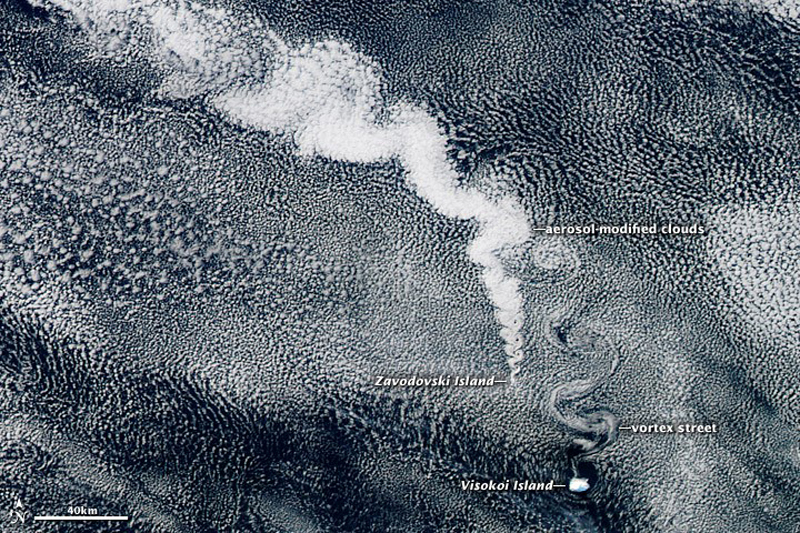 In this image that includes Zavodovski Island taken on 27 April 2012, NASA scientists interpret the sulfate aerosols from the volcano as sufficient to seed clouds in the air masses passing over the island. Note how the plume stretching north is brighter than the surrounding clouds, a result of the small aerosol particle size and the numerous small water droplets that form around them. The smaller droplets provide more surfaces to reflect light. Courtesy of NASA Earth Observatory. Further details from the image can be found at http://earthobservatory.nasa.gov/IOTD/view.php?id=78352 . The BBC conducted a filming expedition to Zavodovski in January 2015 to document the landscape of the island and the behavior of its resident chinstrap penguin colony; while there they observed regular puffs of steam rising from the summit, shown in their expedition report to the SGSSI Government (figure 2). Additional NASA MODIS satellite images of white plumes issuing from Mount Curry were captured by the South Sandwich Islands Volcano Monitoring Blog in January and December 2015, but are inconclusive as to the presence of volcanic ash. Figure 2. Puffs of steam emerge at regular intervals from Mount Curry on Zavodovski Island in January 2015 when photographed by a BBC filming crew that spent 14 days on the island. View taken by UAV from the SW side of the island. Courtesy of SGSSI Government (BBC "One Planet" – Post-expedition report - Zavodovski Island 2015). The plumes in 2016 first appeared in images dated 30 March and 7 April, but the plume content beyond steam is difficult to assess. Images from 1 and 13 June 2016 also show white gas plumes. The British Antarctic Survey (BAS) reported on 6 July 2016 that Mt. Curry began erupting in March 2016. A fishing observer captured an image of an ash-and-steam eruption in June 2016 (figure 3). The BAS noted that fishing vessels in the area captured photos of the eruption with "smoke" and ash drifting to the E, covering the lower slopes of the volcano, and bombs being ejected from the crater. Figure 3. Mt. Curry on Zavodovski island emitting ash and steam plumes during June 2016. Courtesy of British Antarctic Survey. Photo by fishing observer David Virgo. Satellite images confirmed that up to half of the island was coated with ash. 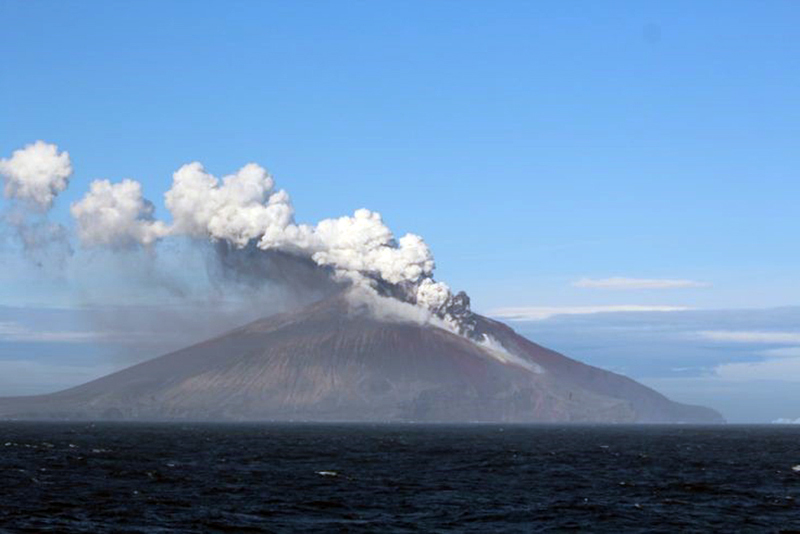 On 20 July 2016 the Government of South Georgia and South Sandwich Islands issued a Navigation Warning noting that eruptions on Zavodovski and nearby Bristol Island were emitting significant ash and dust particles and advised Mariners to remain at least 3 nautical miles from the area. Frequent satellite images of white plumes issuing from Zavodovski were captured in satellite images during the rest of 2016. On 29 August a white plume was drifting NE. Between 17 September and 10 October satellite images captured several white plumes drifting in various directions. On 1 November a grayish white plume was observed drifting E; on 19 and 20 November and 6 December white plumes were observed. A grayish-white plume was captured on 9 December drifting SSW, and on 17 December a large white plume was drifting SE. References: BBC, 2015, BBC Natural History Unit filming expedition to Zavodovski Island, a report to the commissioners office, South Georgia Government, posted at www.gov.gs. Information Contacts: British Antarctic Survey, Natural Environment Research Council, High Cross, Madingly Road, Cambridge CB3 0ET, United Kingdom (URL: https://www.bas.ac.uk/ , https://www.bas.ac.uk/media-post/penguin-colonies-at-risk-from-erupting-volcano/); Government of South Georgia and the South Sandwich Islands, Government House, Stanley, Falkland Islands, South Atlantic (URL: http://www.gov.gs/); NASA Earth Observatory, EOS Project Science Office, NASA Goddard Space Flight Center, Goddard, Maryland, USA (URL: http://earthobservatory.nasa.gov/); South Sandwich Islands Volcano Monitoring Blog (URL: http://southsandwichmonitoring.blogspot.com/). 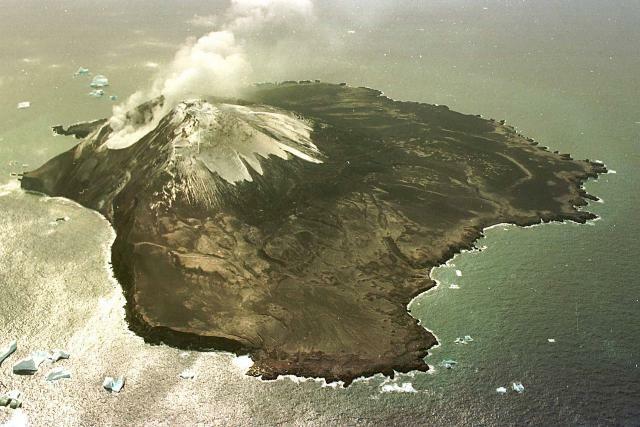 The 5-km-wide Zavodovski Island, the northernmost of the South Sandwich Islands, consists of a single basaltic stratovolcano with two parasitic cones on the east side. Mount Curry, the island's summit, lies west of the center of the island, which is more eroded on that side. Two fissures extend NE from the summit towards the east-flank craters, and a lava platform is located along the eastern coast. Zavodovski is the most frequently visited of the South Sandwich Islands. It was erupting when first seen in 1819 by the explorer Bellingshausen, and the volcano has been reported to be smoking during subsequent visits. There is no Deformation History data available for Zavodovski. There is no Emissions History data available for Zavodovski. Steam clouds rise from glacier-clad Mount Curry, the 551-m-high summit of Zavodovski Island in this aerial view from the south. Icebergs lie off the shores of the 5-km-wide island, the most frequently visited and northernmost of the South Sandwich Islands. Two young eruptive fissures extend NE from the summit toward craters located below the icecap on the east flank and were the source of a lava platform extending toward Pungent Point (right). Photograph by HMS Endurance (courtesy of John Smellie, British Antarctic Survey). The Global Volcanism Program has no maps available for Zavodovski. There are no samples for Zavodovski in the Smithsonian's NMNH Department of Mineral Sciences Rock and Ore collection. Large Eruptions of Zavodovski Information about large Quaternary eruptions (VEI >= 4) is cataloged in the Large Magnitude Explosive Volcanic Eruptions (LaMEVE) database of the Volcano Global Risk Identification and Analysis Project (VOGRIPA).